Moderator Tony Spera welcomes a special guest, psychic investigator John Zaffis, star of the Syfy Channel, Haunted Collector. 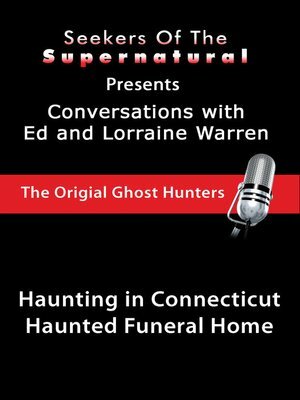 John Zaffis helped Ed and Lorraine rid a haunted funeral home (featured in "The Haunting in Connecticut" hit movie) of the evil and jaded spirits that lurked it's hallways, basements, and bedrooms. The Snedeker family had moved into the home, not realizing it had most recently been a funeral home. The tools and equipment were still in the basement without the family's knowledge! John, Ed, and Lorraine suspected that the violent and often sexual actions of the ghosts towards this family may be due to a past act of necrophilia, sodomizing of the dead clients, from the former funeral home workers. The family had first contacted a local priest who advised them to repeat the rosary until he was able to make a visit. This only further incited the spirits rage as they ripped the rosary to pieces and continued to attack and violate the mother, father, and young niece. The family could take no more and called the Warrens, in the middle of the night, desperately seeking their help and expertise. The Warrens acted immediately, including John Zaffis in the investigation for his opinion and advice. The group spent two nights in the house and had quite a bit of contact with these angry apparitions. There were lights flickering, chains swinging and clanging, and floors shaking. The group quickly realized that these ghosts were not going to be easily pacified and more drastic and immediate action was required. They immediately called in a priest, ordained by the Roman Catholic Church, to exorcise the home. The Archbishop allegedly gave permission for this exorcism, the last before his death. Fortunately, for the Snedeker family, the exorcism was a success and the home is now free of any spirits, evil or otherwise. The Warrens are now part of a book detailing the events of this particular haunt fittingly entitled, "In a Dark Place."